There are thousands of Bootstrap themes out there and all of them are responsive. 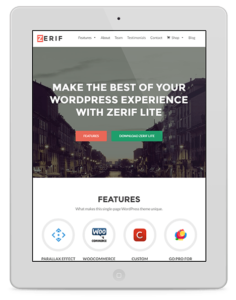 However, even though they in theory display on devices with any size, some of these themes are more suitable for a mobile-first site than others. This is why I gathered an article with 10 free Bootstrap themes I consider especially suitable for a mobile-first site. Most of them are simple, clean, and uncluttered Bootstrap themes that will look adequately on almost any device size. I didnâ€™t favor Bootstrap themes with heavy imagery because mobile traffic is still pretty expensive and you donâ€™t want to drain your visitorsâ€™ pockets with fat images. 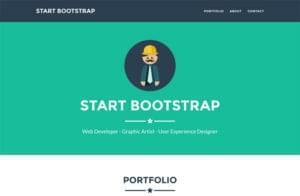 Here are my top 10 free Bootstrap themes. If you are looking for a simple sidebar theme with responsive off-canvas navigation aimed at small screen sizes in particular, try this theme. Unlike many other responsive themes â€“ Bootstrap or not â€“ this one is created specifically for mobiles and other small screen size devices. If you think itâ€™s too minimal for your purposes, you can always add more stuff but be careful not to clutter it â€“ minimalism is its charm. For those of you who are into Material Design, this Material Kit is a blessing. 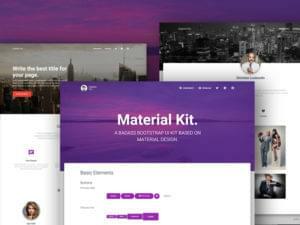 The kit follows the principles of Material Design by Google and it offers 60 handcrafted components, 2 customized plugins, 3 example pages and more. The kit comes in a free and a paid version. 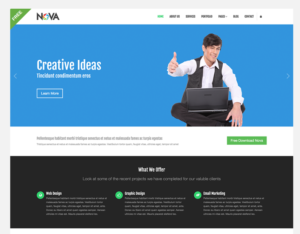 This Bootstrap theme – Nova – is a multipurpose site template. Itâ€™s neither very recent (uses Bootstrap 2.3.x), nor is as minimal as the rest but itâ€™s a pretty universal theme and this is why I decided to include it. It offers 16+ pages, mostly suitable for a corporate/business site but you can use them elsewhere, too. If you are interested mainly in themes for a site of a small company, agency, or freelancer, check this theme. 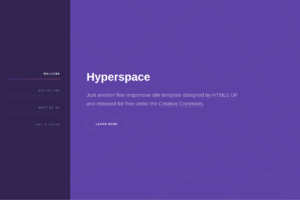 Hyperspace has a clean and simple design with navigation on the side and a huge area for content on the rest of the screen. The theme comes with lots of predefined elements, such as texts, headings, lists, buttons, tables, forms, images, etc. Even though this theme is targeted mainly at freelancer sites, it can be used on other types of small business sites, too. Itâ€™s a one-page theme with lots of features, such as flat icons, compiled CSS, Scrollspy on navigation items, custom outline button style, mobile friendly contact form with floating form labels, etc. It also includes a PHP file you can edit for the Contact form page. Bootstrap is not for static HTML/CSS sites only â€“ you can use it for dynamic sites, too. This is why I included a few free Bootstrap templates for the most popular Content Management System, too. The first free Bootstrap WordPress theme is Housepress. Despite its very modest number of installs (200+ only), this is a great theme for a mobile Bootstrap site. 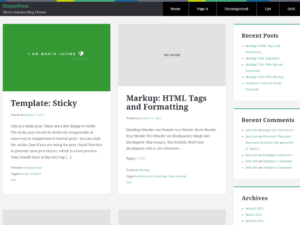 Housepress is a three column theme with menu at the top. Itâ€™s especially suitable for a site with more content, like a blog, or a mini-magazine site. Jstore doesnâ€™t come with a million of installs either but this is most likely because the theme hasnâ€™t been noticed by many of us, not because it is a subpar theme. On the contrary, it is a nice WordPress theme for the WooCommerce plugin. If you are running an online store with the WooCommerce plugin, this theme is a top choice. Itâ€™s minimal but the products you sell get a great exposure â€“ and for an online store this is the most important, isnâ€™t it? 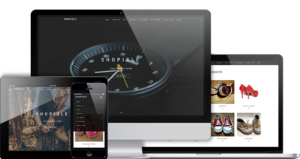 ShopIsle is a one page Bootstrap theme for WordPress and it is one of my personal favorites. I really like its clean and minimal layout that puts the product in the center. One of its unique features is that it comes with a video ribbon. Additionally, it can be easily localized, which is great if the sites you are running are in a language different from English. If you really need a Bootstrap WordPress theme with more images, yet still mobile-friendly, check this one. 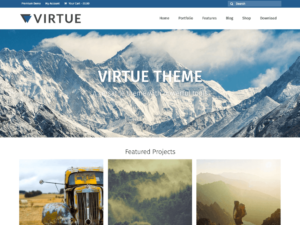 Virtue is a feature-rich theme with lots of customization options (layout, sliders, fonts, etc.). You can use it for a business or a personal site, or for an online store because itâ€™s WooCommerce compatible. The theme uses Schema microdata, which is of big help for SEO. Also, based on the number of installs, Virtue is a pretty popular theme (70,000+). Now back to simple and minimal WordPremes themes with Zerif Lite. This is a one page free Bootstrap theme most suitable for â€œweb agencies, digital studios, corporate, product showcase, personal and business portfolioâ€�. You can also use it for an online store because among the many WordPress plugins it supports is WooCommerce. The theme is also easy to translate and SEO friendly. As great as these Bootstrap themes are, I canâ€™t help but say there is never a guarantee that a particular theme, no matter how mobile-friendly it is, will work for you, so always check on your target devices. Sure, you canâ€™t check it on every single brand and model that exists today, but please check it at least for the major device types, brands, and models on the market today.